Hotel Surya Plaza is a three star professional hotel which redefines luxury hotels in Uttarakhand. Strategically located on the main road, Hotel Surya Plaza is easy to find. It is the only hotel in Kotdwar which consists of an elevator. Hotel Surya Plaza is best suited for business travelers and travelers seeking a luxurious stay. Surya Plaza is well equipped with modern amenities to fulfilling the needs of discerning travelers. Popular excursions of Kotdwar like Sidhbali temple, Durga Dev Mandir, Lansdowne, etc. are easily accessible from Kotdwar. 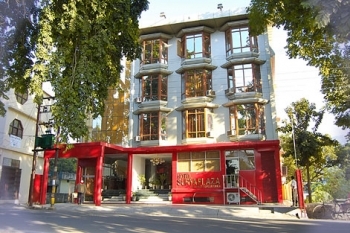 Surya Plaza Hotel is conveniently located on the main road of Kotdwar. Situated amidst green valley of lower hills of Garhwal region, Hotel Surya Plaza is 1.5kms before famous Sidhbali Temple. All the rooms in Hotel Surya Plaza have attractively done interiors and provide with modern amenities. The accommodation in Hotel Surya Plaza is categorized as Deluxe Rooms and Deluxe Suites. Deluxe rooms are available on both single and double occupancy. There are 12 deluxe rooms and 03 deluxe suites. Rooms are spacious with attached sanitized washrooms. Multi-cuisine delicacies are served at the restaurant of Hotel Surya Plaza. The ambience of the restaurant is praiseworthy. The restaurant is conditioned and has a large LCD screen for entertainment. 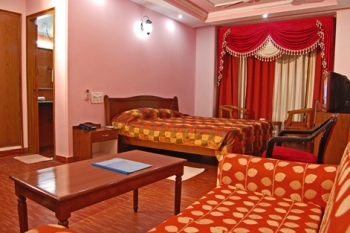 Hotel Surya Plaza is located in Kodwar, 200 Kms from Delhi. It takes around 4-5 hours drive to reach Kotdwar via Ghaziabad, Meerut, Bijnor and Najibabad. You can take train, taxi, bus to reach Kotdwar hotel Surya Plaza.